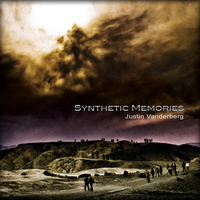 Synthetic Memories delivers eight deeply moving and contemplative tracks of pure wonder, where pulsing electronics, billowing synth textures and rich ambient spaces are perfectly blended into a heartfelt and profoundly introspective musical experience. It has much to offer fans of electronic ambient, from the title track which pays homage to the Masters of the sequencer, to the deeper ambient spaces of tracks like 67, DUSK, and COLD BRIGHTNESS to the perfectly placed piano of THE PATH and DROPS, to the driving and powerful opening track, a collaboration with Jon Jenkins entitled FROM BELOW. With Synthetic Memories, Justin Vanderberg has crafted a meaningful and personal album that will not soon be forgotten.